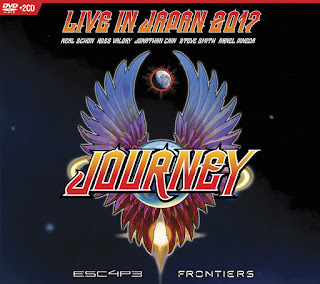 JP's Music Blog: Journey Performs Entire "Escape" & "Frontiers" Albums "Live In Japan 2017"
Journey Performs Entire "Escape" & "Frontiers" Albums "Live In Japan 2017"
The band Journey have certainly had their shares of extreme highs and lows throughout the band's existence. Their first three albums did not sell very well, that was until newcomer Steve Perry took over on vocals and Journey became worldwide superstars almost overnight. After 20 years, Perry quit the band, and Journey were once again struggling to get noticed on the music charts. Then, lightning strikes again when unknown Filipino singer, Arnel Pineda turns Journey into one of the premier live acts in the world. The band's latest new release is a live concert recorded in Japan and captures Journey performing their two most well-known studio albums ("Escape" and "Frontiers) in concert. The new release titled "Live In Japan 2017: Escape + Frontiers" will be released on March 29th through Eagle Rock Entertainment as a Blu-ray/2CD set or as a DVD/2CD set. Right from the opening notes of "Don't Stop Believin'," you knew that this was a special performance, as these two albums have definitely stood the test of time. Journey runs through the "Escape" album flawlessly, performing the fan favorites "Stone In Love" and "Who's Crying Now." You can almost feel the emotions flowing through the audience, as they respond to Arnel's energetic stage show. The film tries to capture every moment by switching between guitarist Neal Schon's amazing solos, drummer Steve Smith's powerful fills and keyboardist Jonathan Cain memorable tapping of the keys. The band's original "Escape" and "Frontiers" albums line-up (minus Steve Perry) seem to feel a renewed energy, playing these two iconic releases in their entirety once again. The deep cuts like "Still They Ride," "Dead Or Alive," "Chain Reaction" and "Back Talk" seem to have a renewed energy when performed live. Whether watching the video or listening to the CDs, you could almost mistake Arnel's vocals for Steve Perry classic sound, especially during the ballads "Open Arms" and "Faithfully." This new live video comes at you from many different angles and uses high definition cameras to make "Live In Japan 2017" the new testament to this current line-up of Journey. You will certainly find yourself putting this new live album on repeat. To find out more about Journey and their latest release "Live In Japan 2017: Escape + Frontiers," please visit journeymusic.com.